There’s some good news today for owners of the Motorola Droid Ultra, Droid Maxx or Droid Mini as a camera update is now available for all three smartphones. At the same time as the Droid Ultra, Maxx and Mini camera update was confirmed there was a tease of another update being worked on, and this could be Android 4.3. We already knew that soak testing for a camera update was taking place for these devices and now Motorola Mobility’s VP of Product Management Punit Soni has announced that the update is ready. The update should be being rolled out as we speak, and will bring enhancements to the camera. The rear camera will have improved focusing, white balance and HDR and also more consistent exposure, and this will be welcomed by many Motorola Droid Ultra, Maxx and Mini owners. As well as this, owners can also benefit from 50GB of Google Drive free storage for their devices, in addition to the standard 15GB offered. Many owners of these devices may well be wondering when they will be receiving the Android 4.3 Jelly Bean update, although Android 4.4 was also recently announced. At the same time that Soni confirmed the camera update he also left a further tantalizing snippet. 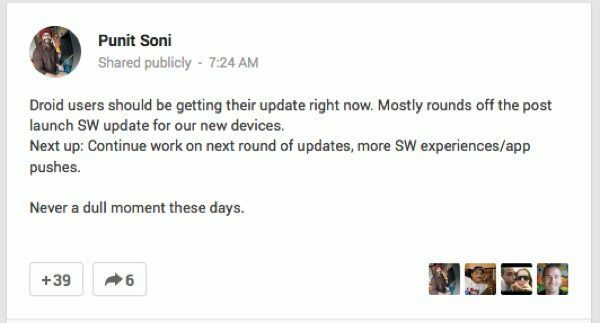 On Google+ Soni teased that work was continuing for the next round of updates, so hopefully the Android 4.3 update may not be too far behind the camera update being pushed out now. Fingers crossed! Do you have the Motorola Droid Ultra, Droid Maxx or Droid Mini? If so, have you already received the camera update and what do you think of the improvements? Are you hoping that the Android 4.3 update also arrives soon? currently downloading. its sooo slow. All kinds of updates, I thought the camera was really good from the get go, so I don’t notice much. Google drive space is a plus. Also, maps, keyboard and a bunch of Google/Motorola apps got updates along with the camera. Moto is bypassing 4.3 and going straight to KitKat. That’s 4.4 for those keeping score.